Mission Statement: That the songs on this album would reflect the musical gifts the Lord has given John David Webster to share John's personal love for Christ and His Gospel. "I wanted to make a record and write songs that could reach people on a real level. We're people first, and great music is great music. I wanted to start with that. I don't want anyone to feel excluded by my music." "You and me were made to shine, beyond the stars, beyond the sky, you and me were made to shine"
John David Webster grew up in Indianapolis, Indiana. Throughout Webster's childhood and youth, the Lord was preparing him for a music ministry through people and experiences in his life. He was blessed with a Christian family, a supportive church family, spiritual mentors, and many opportunities to develop and grow his considerable musical gifts. "I was adopted at birth, raised in an amazing Christian family. I was always told growing up that my parents chose me and loved me, and that God had a unique plan for my life. I grew up in the church. My mom led the choir." Spiritual Influences - John David Webster: "Too many to mention, but my dad & mom, my youth pastor growing up Rick Hall, my pastor / friend Pete Nelson, as well as my father in law." "I loved music at a early an age. I would play the piano and try to figure out the latest songs on the radio. When I was in Jr. high, I started a band with kids in the neighborhood and at church. We took it really serious and wrote original songs and covers." His high school years brought opportunities to develop his musical gifts. While his teenage peers would go out on the weekends, John spent much of his free time practicing the piano and composing music and songs, as he was passionate about music. "When I got into high school I played piano in the Jazz Band, which is where I learned about chord structures and music theory." After enjoying a Rich Mullins concert held at his church, John David Webster began to think about going on to the next step; turning his passion for music into a career of composing music. "Out of high school I recorded my first professional CD, and interned at a recording studio, where I learned how to mix and mic instruments." Musical Influences - John David Webster: "Peter Gabriel, Sting, U2, Daniel Lanois, Emmy Lou Harris, Stevie Wonder, Billy Joel, Keith Green, Rich Mullins, and many more....". When a person knows from an early age, that the Lord has called him or her into a specific ministry, it isn't always an easy idea to accept or have an enthusiasm for, and the person may have mixed feelings. John David Webster struggled with accepting this special calling, because he probably looked at it as a duty, not yet as a joyous expression of praise, worship, and a blessed opportunity to share Jesus with the world. To complicate things, John David Webster drifted away from the Lord. However, the Lord wasn't done with John David Webster yet; and the Lord is very patient with us all. John David Webster shares, "All my life, as early as I can remember. I've known since I was a boy that I was going to do music for God, I fought that calling especially early on. I wanted to be like everyone else. I didn't want the responsibility. Now I have learned to love it." John David Webster continued to talk about the moment in his young, post high school life when his drifting away from the Lord did an about face and his outlook on creating music for the Lord changed as well; when he experienced a "profound conversion," at age 21. Making music for the Lord became a joyous full-time occupation. John David Webster graciously shared with us this profound conversion that changed the direction of his life so dramatically; A Paul falling off his horse on the way to Damascus moment. ChristianMusic.com - Any life-molding experiences you all would like to share with us, which were uplifting or were difficult but shaped your thinking, you music, your outlook, your spiritual walk? John David Webster shares, "My biggest moment was when I fell in love with Jesus. I was experimenting with drugs after high school. One night I was hanging out with some of my 'friends' and I was being pulled out of my body into hell. I wasn't thinking about God at all, but the name of Jesus just 'came to me'. I cried out on the name of Jesus and He saved me." "He is all I need, and it was like all the lights came on. I became completely sober, and my life changed in one instant. I felt all of God's love and grace wash over me. For the 1st time I knew who I was, and why I was here. It was like I was alive for the 1st time. The sky was bluer and the grass was greener. I felt God everywhere all around me, reaching out to me all the time. It was incredible! That was a special time in my life." "I remember picking up my Bible and for the 1st time it wasn't 'the bible;' it was alive, and God was talking to me through this book! Verses like Psalm 18, and 'there is no other name under heaven where a man can be saved' took on a whole other meaning. I had to tell all my friends about Him, a lot of them got saved and are walking with him today." "When I was 21 I truly surrendered my whole life and music to Him. I fell in love with the maker of music, Jesus. It has been an awesome adventure, singing around the country and world to and for Him. I've seen lives changed including mine by this amazing grace!" This joyful, spirit-inspired change / transformation of John David Webster was clearly seen by others, affecting the people around him. After surrendering his will and his life for the glory of the Lord, John David Webster was filled with the need to draw close to God and share God's love he had just personally experienced fully for the first time. John David Webster became a worship leader at a church in Indianapolis, and performed in free concerts around Indianapolis, sharing his music and redemption story and recorded his first independent CD. During this time, his personal life also bloomed as he married the love of his life, Kirsten, his pastor's daughter, which was the beginning of more incredible moments in his personal life. John David Webster shares with Christianmusic.com, "I had many other incredible moments, especially when I met my beautiful wife Kirsten, and boys Zion (4), and Jaden (2) were born. Tears of Joy!" The Lord also began to open the professional career doors to John David Webster again. Doors opened as John David Webster worked hard, paid his dues, and focused on Jesus. John David Webster began opening concerts for Christian bands, including Delirious, Third Day, Rich Mullens, and The Kry. He then got to go on tour with The Kry, playing keys and guitar. This change / transformation of John David Webster was clearly seen / felt by others. Webster played for Billy Graham Crusade events, Promise Keepers and Calvary Chapel events, and Greg Laurie's Harvest Crusades, as well as with musicians who've played in bands with such big name people / groups such as Sting, Elton John, James Taylor, and Seal. John David Webster then spent two years touring as a solo artist, becoming a father during this time to two wonderful sons, Zion and Jaden, entering the wonderful world of co-parenting with his wife Kristen and family life. John David Webster's journey to getting a recording contract with BHT records got a big jump on the fast track when he happened to meet the daughter of music executive Mike Blanton's daughter Booth at one of his gigs in Colorado. Booth was impressed with Webster's music and gave her father a copy of Webster's CD, TOWARD THE WESTERN SKY. Mike Blanton was also impressed with Webster's music and expressed interest in doing a project with Webster! Three years later, after "woodshedding" the compositions which became the collection of songs for MADE TO SHINE, John David Webster signed a contract with BHT records. YEAH! John David Webster comments to Christianmusic.com,"I love all the songs on the record. I wrote 100 songs and finished 50 songs and we narrowed it down to 11". What a musically creative, spiritually uplifting, and poignant collection of songs, performed by a gifted Christian music performer and composer, John David Webster, who shows his love, joy, and heart for worship for Jesus through his music, as it shines like a lightening bolt! He not only can compose uniquely different compositions that support so well the lyrics and message of each song, but also offers the listener a variety of vocal styles which offer sparkle and life to his lyrics! ChristianMusic.com asked John David Webster, About Your Music..... How would you describe it? John David Webster: "Art. I want to do something I've never done, that will speak to people about the love and grace I have experienced. I'm always trying to go somewhere different or new. Somewhere I've never been. A thought or something takes me somewhere, I imagine someone hearing the song for the 1st time, and imagine how and where a certain lyric or melody moves them." John David Webster's description of his music is very much evident on this album! To the benefit and blessing of the listener, MADE TO SHINE presents a unique variety of poignant & heartfelt to rousing piano-based Christian acoustic, pop, rock, blues, and Gospel songs which are paired with a variety of vocal styles to match the mood and message of each, dynamically performed in John David Webster's own style! John David Webster's music is delightfully full of the Spirit, and makes great use of the piano, a versatile instrument that not only has every major and minor key chord and melody / counter melody possibility at a composer's finger tips, but also can be used to effectively add continuity, feeling as well as spirit, rhythm and drive to a composition. Just the right combination of instrument voices and embellishments along with the piano voice and vocals is most enjoyable to adsorb, as the music catches the soul and flows through one's being. The Holy Spirit works with Christian music artists in uniquely different ways, depending on the artists' individual gifts and personalities. Christianmusic.com asked John David Webster specifically about his own creative process in creating songs for the Lord. John David Webster explains where his songs come from and what in his life inspires them. "My songs come from my heart. I sing about where I come from, and where I live. I write about the scenery of my life and the beauty and struggles of my family and friends." His songs which truly come from his heart, explore areas concerning God's love for us, human joy, and human pain and how it all connects, on a musical and lyrical level that the listener can identify with and drink in the message and mood of each composition, and then receive comfort, encouragement, hope, and the reminder that Jesus is our source of strength, hope, and love and sets us free. Christianmusic.com had to know how John David Webster composes his songs and lyrics which bolster one's spirit and love of the Lord. Christianmusic.com: How do you compose your songs? Do you compose from a keyboard or guitar? John David Webster replies, "I am a piano player at the end of the day, but I play guitar instruments as well as a little drums. I write on both and in many different ways." What comes first, the lyrics or the melody / composition? John David Webster continues, "When a thought comes to me, sometimes I think 'This would make a great song', or other times titles just fall out of the sky, and the songs sort of write themselves and tell me who they are and where they want to go, even in co-writing. I think in melody, and melodies follow me around, I can't get away from them. Sometimes I will try to compose new chord structures and new ways to do verses with odd time signatures and other things to make a fresh impression on me." "I'm always trying to go somewhere different or new. Somewhere I've never been. A thought or something takes me somewhere, I imagine someone hearing the song for the 1st time, and imagine how and where a certain lyric or melody moves them." The spiritual messages of the songs can be put into five categories, though a few could be in more than one category. After experiencing these blessings, one naturally would be filled with a desire to use our God-given gifts to shine for the Lord. 1 John 4:19 - We love because God first loved us! I highly recommend this most meaningful / most entertaining collection of songs for your Christian music CD collection. MADE TO SHINE CD shines with both uplifting spiritual messages, dynamic vocals and uniquely entertaining musical compositions to carry each message, much to the blessing and enjoyment of the listener, who will find encouragement to shine for the Lord. Favorite song of this reviewer! A great choice of an opening song for either a concert or a CD! A Praise and Worship song with a lot of zing, with a composition & message which gets the listener hooked at once!! A perfect vehicle for the song's message; to shine for the Gospel and for the glory of our Maker; using what is unique about each of us - Our God given talents and gifts. Listener can't help but get energized along with the infectious spirit of the song, and irresistible catchy melody, and message it brings. An enthusiastic, rousing piano intro, with electric guitar & organ embellishments joining in, really cooks - Sets and propels the energetic, joy, and dotted quarter note / dotted 8th rhythm of this delightful, lively musical accompaniment found throughout the composition soaring! Very good dynamics, a nice blend of electrical guitar, organ, easy beat rock drums, which supports the spirited piano melody support and inspiring vocals. Love the soulful / rock / edgy singing style of opening vocals by John David Webster, an interesting cross between Gospel, folk blues and rock, which punctuates the lyrical message, and sits nicely on top of the spirited accompaniment. Nice change to a smoother, softer vocal style during the bridge, with a smoother backup musical sound as well. Nice choral arrangement in the parts of the verses and the Chorus, Hook. I was in the void. We were in the dark. God made the world, and lit a spark. Gave it life, set it free. A gift of love, with a heart to dream. Chorus: You and me were Made to Shine. Beyond the stars beyond the sky. You and me were Made to Shine. Bridge: We were meant for more than this, With a smile and a kiss. There's no better time than this. Hook: We were made to shine, Come on and shine some light on me, Come on shine, honey, shine, Come on won't you shine, shine, shine. Shine come on and shine some light on me. Third favorite song of this reviewer. Spirited Christian rock, done John David Webster style! Webster's energetic, joyous vocals along with the equally lively musical accompaniment bring the message roaringly to life, reflecting the joy and exuberance one can experience after accepting Jesus as Lord and Savior, becoming a believer. 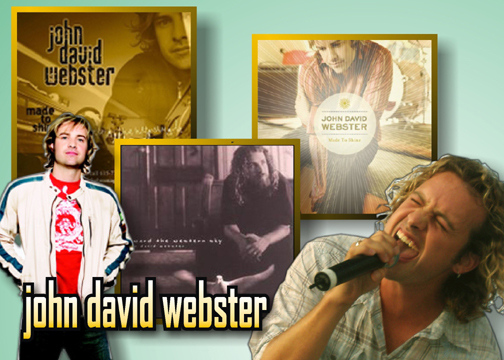 John David Webster shows his vocal range and creativity in several singing styles. Webster sings in a low octave, sort of reminds one of a David Bowie-like quality only more effective, during first verse. During the Hook, John David Webster sings in a smoother, quieter style. He also has a fine "rocker voice;" effective, emotional yet always on key! Creative musical touches makes the composition interesting! Intro starts the energetic eighth note rhythm with the piano with flute embellishments during first 2 stanzas, when drums and guitars join in as well. Electric guitars at the end crisply pound out in unison the eighth note rhythm played in the beginning intro by the piano. Great dynamic changes are effective; - A nice combination / intermingling of full rock sound bursts with piano/ guitar parts, in verses & bridge, which builds into the joyous chorus. Composition & vocals segue into a quieter mood via a small interlude, during the Hook, as the main point of the lyrics is sung, but things build throughout the Hook into once again a joyous chorus - until the tag which is a rock frenzy! Cross the brink scrape the edge, Feel the wind hit your chest. Feel the rush, take the leap, You're flying fast, you're landing free. Bridge: ahhhh, ahhhhh, Come Alive, ewww, yeah, wake from the dream, ewww, ewww, Come Alive! Chorus 1: YEAH! Stand in the light of the sun. The breath of your life has just begun. When you come, Come Alive! The freedom fights in your soul, it takes you down so let it go. The lightening strikes, the feeling burns. It reels, it cries, it craves, it yearns. Bridge: Come alive, wake from the dream, come alive. Hook: If you want it, you got it, you know, it's for free If you want it, you got it, you know, just believe, just believe. Tag:YEAHHHHH! If you want it, come and get it now If you need it, come alive You got to come alive, You got to come alive, You got to come alive, come alive. Upbeat, energetic praise, and worship pop-rock song, with a catchy melody and rock beat, fine, strong vocals and inspiring lyrics which made this song popular when released as a single, making the Christian music charts. Composition offers a very nice blend of acoustic /electric guitars, keyboards, light strings which offer both counter melodies and melody / rhythm support. John David Webster's vocals once again bring to the listener the surprising awareness, gratefulness one feels when the Lord moves in our lives, through his Spirit in sometimes unexpected ways; yet happens to be just what we needed at the moment! Nice segue into Bridge. Composition quiets down and spirit of song becomes poignant, supported by light strings through 2/3rd's of Bridge. Last 3rd segues back into rock beat. I love the way you touch me, I'm so amazed! Your beauty speaks a thousand words, and then it takes my breath away. You burn me up like fire, and then you pour on me like rain It's truly amazing, like a miracle. Chorus: I see you in the sun that shines in the sky I hear you in the sound of the oceans tide I feel you in this gentle breeze tonight I try to explain it It's a miracle to me. You can move my mountains, you can still my soul You whisper to me like the wind, but it shakes me to the bone Your Spirit takes me far away, but I feel just right at home It's truly amazing, like a miracle. Bridge: Truth be told I wasn't one for miracles. Let's just say I've changed my view. Cause loving you I've been awaken, The earth starts quaking. I'm blown away I'm overtaken By the miracle, the miracle of you. I see you in the sun that shines in the sky I hear you in the sound of the oceans tide I feel you in this gentle breeze tonight. Tag: I try to explain it I just can't contain it It's truly amazing It's a miracle to me. Oh yeah, Oh yeah, a miracle to me. A poignant, heartfelt ballad about how wonderful and dependable the Lord's love is for us. Webster's uplifting, strong vocals, and lyrics are the stars of this moving song, with a beautiful melody, supported by piano and delicate guitar, synthesizer, easy beat, strings, cello, and moving dynamics. A real spirit lifter!!!! The perfect answer to the song below - WAIT FOR ME. John David Webster comments: "My favorite song right now is REAL LOVE, because of the unique chord structure and melody, but the message is very universal to our human condition." "Like Paul said we can have it all, but if we don't have love, we don't have anything. And these 3 remain, faith, hope, and love, but the greatest is love. When we get to heaven, and see the Almighty, we won't need faith or hope. God is love, and we'll will see Him in all his glory." Where do we go, when it seems we've gone too far We've got to take it back to the very start And why is it so, though we might have all we need It feels like we're missing everything. Chorus: Real Love, arms to hold you through the pain Like summer shining through the rain Real Love, when all our faith and hope is gone We'll find that love will keep us holding on. Why do we go, spinning wheels around so fast. We try to make the moment last. How can we know, is it written in the sky Or has it been here all this time. We're floating in the blackest night Distant as a satellite We search the universe to find The reasons why. Hook: Blowing through us like a breeze In and out the air we breathe. Real Love, waves are breaking all around, I'm swept away when love surrounds. Tag: Real Love, come on now and light the spark The flame will drive away the dark Real Love, in the silence in the sound It's all about and all around We breathe it in, we breathe it out. A joyful love song to a beloved wife or husband - one of life's joyful blessings -- A loving marriage! Bright melody starts off with a nice blend of acoustic guitars, piano, keys, synthesized flute with a light airy beat which all nicely comes together as a joyful love song of thanksgiving. Acoustic ensemble well played and composed. A snappy beat keeps things moving. Interesting melodies / counter melodies in the composition adds spark as well. One enjoys the usual great enthusiastic vocals by John David Webster, who truly believes what he sings! The first rays of early sunlight They chase the shadows from the dark And as my eyes are finally opening It's like you wake the deepest part. Chorus: Cause you give me love, show me love, give me love like an angel You give me love, show me love, love sweet love You give me love, show me love, give me love like I've never known You give me love, show me love, love sweet love. Chorus 2: You give me love, show me love, give me love like an angel You give me love, show me love, love sweet love You give me love, show me love, love like I've never known You give me love, show me love, love sweet love. Yeah, love sweet love Give me love, show me love, love like an angel Give me love, show me love, love that I can feel Give me love, show me love, love like I've never known You give me love, show me love yeah, give me love Love sweet love. Favorite Prayer Hymn of this reviewer! A solemn 3/4 meter worship prayer hymn about our need for the Lord and surrendering one's will to the Lord. Beautiful melody and Heartfelt vocals beautifully portray the poignant lyrics in true John David Webster style. Nice harmonies in 2nd verse. Song would fit easily into any type of worship service. Starts off simply with piano chords with soft guitar embellishments & counter melody through first verse and builds through chorus. Musically, the composition builds in intensity and musical voices, with strings, a cello, and more intrinsic guitar parts. All provide a creative blend of chordal support, counter melody and sparkles of instrument embellishments, which works well with the 3/4 meter. Very effective decrease in sound through HOOK and Tag. John David Webster comments: "It talks about the feeling of complete surrender of letting go and letting God take control. Throughout my life there have been times I struggled and fought with myself over what I know I should do. God's just always there to pour out more grace. Jesus said that unless you become like a child, you won't enter the kingdom. My first response to getting more responsibility in my career was to take more control - but this song's about giving God everything, and that place of peace afterward. I wonder why don't I let go? Why do I fight so hard? I find all I need is God." Tonight, it's all black and white, The sky is so quiet But inside a battles raging wild. Why do I fight? Why do I fight Heaven's love? When all I need, is more of you in me. The dawn chases the dark, out of my heart, As tears of gladness roll. They wash over me, like the waves of the sea, Shouting out their hallelujahs. Bridge: And I am free, with more of you in me. Chorus 2: Now, I need you now More than the air I'm breathing. Now, Yes I'm crying out, from the depths of my inmost being. Now, come have your way with me. Stay close and never leave, Until you're the heart that beats, Inside of me. Tag: Yes I need you now, yes I'm crying out, And all I need...... Is more of you in me now. I need you now........ Yes I need you now. There is more of you in me now. Second favorite song of this reviewer. A touching, heart-tugging song about grieving the death of a loved one / seeking comfort from the Lord - Song sure helps to vocalize through music the sea of grief mourners must pass through which isn't easy, often painful - an unpleasant part of the human condition. Song reminds the listener with the hopeful promise that we will see our loved ones in Christ again. As Jesus was resurrected, so will his believers! Beautiful melody begins with an interesting intro by pedal steel guitar, which slides into a segue and leads to a combination of solid piano chords & broken chords, plus interesting embellishments of steel guitar and interesting base plunks on an instrument I don't know. Chorus has a nice counter melody which supports the main melody carried by stunning vocals. Dynamics again builds nicely, and more instrument voices add to the color of the sound and dramatic feeling of this truly lovely composition, which swirls over the listener in such a poignant way. In my desperation, with my arms open wide I lift my hands to the sky. Can you hear me calling? Are you there at all? Are you right beside me? I just need to know you are. In my heart, in my dreams I see you standing there. With my eyes, you know I'll, see you again. Down deep, in my soul, In the silence of who I am. In my heart......... You wait for me. Oh the stars are falling, across the world tonight. My heart is breaking, no nothing's right. Was it a burst of glory? Did your spirit fly? Only wish I had, one more chance to say goodbye. Cause in my heart, in my dreams, I see you standing there. And with my eyes, you know I'll see you again. And down deep in my soul, In the silence of who I am. In my heart......... You wait for me. Bridge: So hold me tonight. Until the pain and the fear subside. I know love will never die. Cause this is more than I can bear. And I know that you're still there. Waiting, waiting. Cause in my heart, in my dreams I see you standing there And with my eyes, you know I'll see you again. And down deep, in my soul In the silence of who I am. In my heart, I'll see you again. Someday, Someday I'll see you again. I believe, I know one day I'll see you. I believe, I know, you wait for me. Written in a minor key, composed in an interesting meter, this ballad tells the story of a believer urging a seeker to get off the fence and declare belief in Jesus. Melody begins on a sorrowful tone with a synthesizer like sound in-between piano chords. Then drums join in to establish the beat during second stanza. First verse features vocals, piano chords with drums and embellishments of synthesizer like sound. Sound builds nicely until the chorus, when electric guitars join in. Keyboards playing quietly in the background during 2nd verse. Enjoyed the change of tone - lighter feeling in the Bridge 2, I think, composed in a major key? I see it in your eyes. I know your disguise. Because I had it on before you. And oh I wore it well, And that's how I can tell. You're trying hard not to hide the real you. Bridge: Come on stand on your feet You know its time to let go, believe! Because the grave is empty you're free. If you're looking for what's real, You got to rise above. Chorus: Give me some soul! You got to know, If you want to get to something real, You got to rise above. Oh now there you go, Bleeding all alone! But you won't let nobody help you. Cause guilt is like a knife, It cuts into your life, But don't you know that love can heal you? Bridge: Come on stand on your feet You know its time let go, believe! Because the grave is empty you're free If you're looking for what's real You got to rise above. Chorus: Give me some soul You got to know If you want to get to something real You got to rise above. Give me some soul You got to know! If you want to get to something real, You got to rise above. Bridge 2: I see you standing there. You're reaching out for love I feel the fight that's going on. So come away with me Cause it's your destiny. It's your time to fly, come on! Chorus 2: Give me some heart. Give me some soul. You got to know. If you want to get to something real, You got to rise above. Give me some soul. You got to know. If you wanna learn to fly, you got to rise Come on now, it's time to get away You know you got to leave, stand up on your feet. Come on now, you know it's time to leave If you want to learn to fly, you got to rise. You got to know, Yeah. Come on, Come on, come on Yeah! An interesting combination of Gospel, blues, soul, a touch of jazz, and of course rock! A catchy melody peppered with lots of dotted 8th notes and flavored in spots with syncopation, which John David Webster vocally provides readily with spirit, in contrast with the solid, on the beat accompaniment consisting of solid and broken chords, courtesy of the piano, guitars who also provided some counter melodies and other embellishments of interesting sounds! Where you gonna be baby? When the sign on the door reads closed And all your friends have packed their bags You're sitting there all alone. Where you gonna be honey? When the cold wind starts to blow And the sun is gone, the lightning strikes You got no place to hide. Bridge: You're gonna let go, move on, admit you're not that strong. Chorus: Come back once again, to the girl you were back then Lighten up that heavy load, free your mind and free your soul Come back once again, to the girl you were back then Living life is letting go, lighten up that heavy load. You're stuck in the gridlock You wanna move but the traffic's stuck And the light won't change from red to green And everything inside just wants to scream. Piling high like a ton of bricks It's raining cats and dogs but you cannot fix Your life to save your life. But honey don't you think its time. You're gonna let go, move on, admit you're not that strong. Come back once again, to the girl you were back then Lighten up that heavy load, free your mind and free your soul Come back once again, to the girl you were back then Living life is letting go, lighten up that heavy load. Oh baby, you're a shooting star Oh honey, you know you are now, now Oh baby put your mind at ease Oh baby I'm begging please, please. Come back once again Lighten up that heavy load. A rousing acoustic rock praise song which cooks along with pep and vigor thanks to not only the energetic joyful vocals of John David Webster but also because of the cooking acoustic guitar ensemble, supported by electric guitar & keyboards in the background. I'm sitting alone, and I'm watching the sky Something is stirring within, but I don't know why I try to push it away, leave it behind , yeah! My heart starts to pound, there's a change in the wind And the longings I dread, are calling to me again To some other place, that I've never been yeah! Bridge: Then a presence comes over me. I leap up in the air and then. Chorus: You pick me up, You pick me up, You pick me up, Oh Yeah. Chorus: You pick me up. And in your light I can see light You know it feels so right I never felt this way Your touch I can't explain But Lord it gets me high. You pick me up You pick me up, when I'm down You pick me up, like a child. You pick me up, every time You pick me up, when I need a Pick me up And in your light I can see light. A great composition to end this CD - On an uplifting, comforting note! Beautiful blend of acoustic / electric guitars, keyboards, light pickings of a stringed instrument, easy drums and other instrument voices which give the song a nice energetic drive with a sound full of various counter-melodies and embellishments which nicely support the inspiring vocals by John David Webster, becoming an asset to the main melody as well. The Bridge and at the very end of the Hook the composition changes from energetic to a smooth, quieter, swirling peaceful feeling. A big blue spinning ball, Twirling so fast you can't feel it at all. Zoom in there you are! Your troubles seem big But Lord they look so small. Your tears fall. Do you ever stop to think, There's more than this, and we're closer than we dream. So hey now don't you weep. Just close your eyes, baby, so that your heart can see. Chorus 1: That it's all for you! Every blade of grass, the sky, the moon. And it's all for you, Baby this world . It's all for you. Feel the wind dance on your skin She comes and she goes, but Lord knows where she's been. And all creation sings. A cry to the world for every part of you to live again. Chorus 2: And it's all for you Every blade of grass, the sky, the moon And it's all for you, Every breath you take, every step you move And it's all for you Baby this world It's all for you. Bridge: God loved the world, He made it in seven You know He didn't need it cause He lives in heaven I guess that's why He sent his Son to rest His case To show us once for all, and to all the human race. If you could see beyond You'd catch a glimpse for a moment, but then it's gone But its fragrance lingers on And one day we'll see the all the colors, shining in the face of love. Chorus 2: And it's all for you Every blade of grass, the sky, the moon And it's all for you Every breath you take, every step you move. Hook: And it's all for you, baby this world, Honey this world, baby this world........ It's all for you. John with new daughter, Aria Hope Webster. John and Kristen gave birth to their third child, Aria Hope Webster, a healthy 10 pounds, 9 ounces and 22 inches long. Her big brothers Zion and Jaden are thrilled to have a little sister! John David Webster continues to "to garner praise from all quarters of the industry."